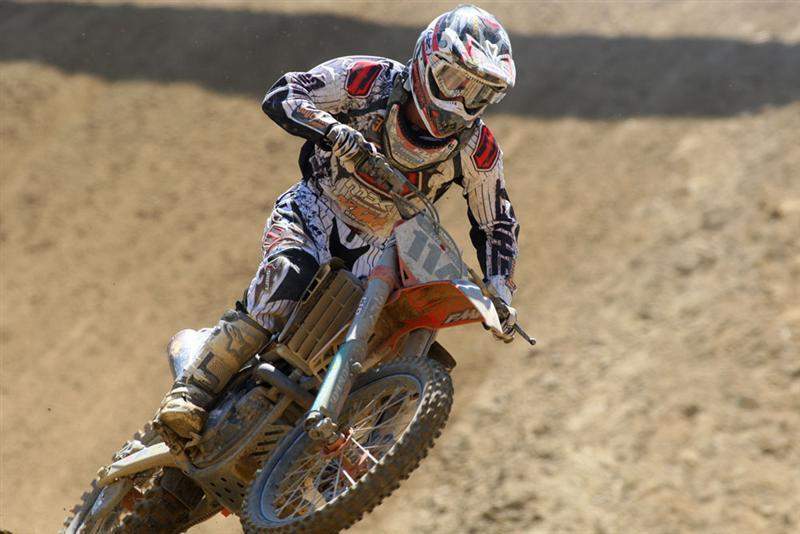 San Bernardino, CA – Muscle Milk/MDK/KTM Factory rider Tommy Searle earned a top five finish in his debut in the Lucas Oil Motocross Championship Series. Searle had a great start when the gate dropped for the first moto coming around the first turn in 2nd place. He was still inside the top three as the first lap was coming to an end, but unfortunately, that race would be red-flagged and the riders were sent back to the starting gate to begin the race again. The second attempt was just as successful for Searle. He came around the first turn in 3rd and remained up front. His teammate Wil Hahn also had a great start rounding the first turn in 5th and the third member of the team, Martin Davalos, started mid-pack around 15th place. The Muscle Milk/MDK/KTM riders continued to turn in impressive lap times. Searle spent the majority of the race in 5th position but moved up to 4th right before the checkers. 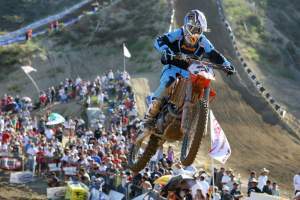 Hahn maintained a steady pace and finished 11th overall while Davalos dropped back due to a leg injury that became inflamed during the race and finished mid-pack. A newcomer to the Motocross Lites class, J-Law Racing’s Max Anstie, started around 20th and worked his KTM up to 13th before a crash sent him over the bars and ended his race day. Anstie was taken to the hospital for further evaluation and is hoping to return for the Hangtown National. In the second moto Davalos got the holeshot on his KTM 250SX-F machine followed closely by Searle. 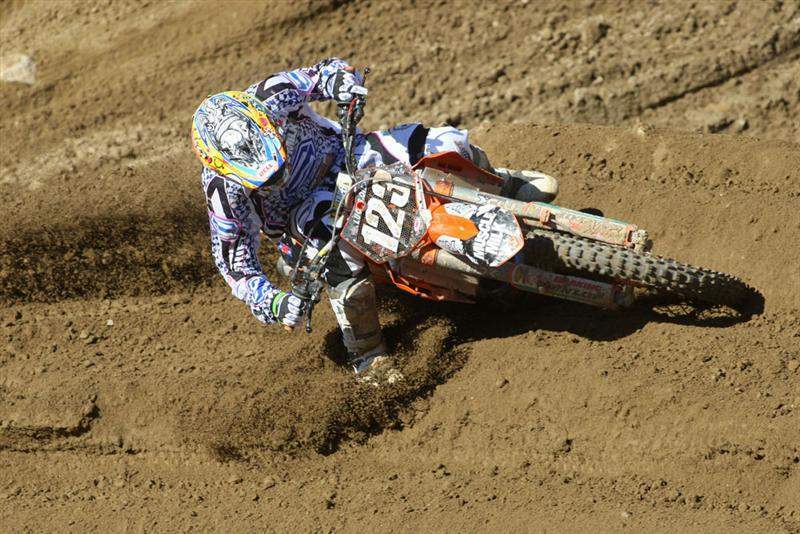 The Muscle Milk/MDK/KTM teammates led the first couple of turns together until Justin Barcia was able to get around. Davalos again faded back due to a lingering injury and eventually had to pull off while Searle was able to maintain pace and stay close to the #151 bike of Barcia. Hahn got pinched off on the start and came around the first lap in dead last. Hahn pushed through the pack and by lap six had moved up ten positions and was sitting in 25th position. Searle held 2nd until lap four and then remained in 3rd position until the half way mark. A mistake on lap nine allowed another rider to pass moving Searle back to 4th. Searle then began a five lap battle with Austin Stroupe for 4th position. On the final lap after swapping positions twice, Searle won the battle taking 4th place by half a wheel length. The Motocross class marked the debut of Jagermeister/MDK/KTM Justin Brayton’s first full-time 450 season and the return to motocross racing for the 2001 125cc Motocross National Champion and Shock Doctor/KTM rider Mike Brown. The Jagermeister/MDK/KTM ride of Josh Summey also returned to racing since his hand injury which left him sidelined for half of the Supercross season. The gate dropped for the first moto and the crowd cheered loud for the #3 bike of Brown who rounded the first turn in 3rd position. Brown showed the crowd why he is a past champion as he continued to battle within the top five for the first few laps of the race. Brayton wasn’t as fortunate as Brown on the start and came around the first turn in 20th. Summey was a little farther back in 25th. Near the end of the moto Brayton had moved up to 13th position and was closing in on the 12th place rider when he suffered a crash on a downhill in the back of the track. He was able to remount but had lost valuable positions and finished 21st. Brown rode a solid moto and finished 8th. In the second moto, Brown was up front again in 7th position while Brayton was a few spots back in 14th. Summey started near the bottom twenty and began to move his way up. Brayton quickly caught up to Brown and the two KTM riders began to close in on the front of the pack. At one point Brayton passed Brown for 8th position and pulled a few bike lengths ahead. Near the end of the moto Brown passed Brayton back and took over the position. With two laps to go Andrew Short, running in 6th, made a mistake that allowed Brown and Brayton to pass. Brown held his pace and finished an impressive 7th overall while Brayton finished a solid 9th place. Summey encountered a bike problem and was forced to pull off the track on the fifth lap.